The next great peripherals war is being waged over your ears. After every company on the planet put out a gaming mouse and then a mechanical keyboard, now it’s time for headsets. 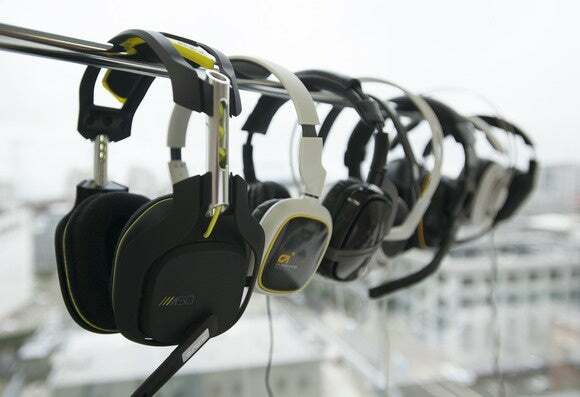 So many headsets. We know you don’t want to scroll through every single headset review when all you want is a simple answer: “What’s the best gaming headset I can buy with my hard-earned dollars?” This page holds the answer you seek, no matter what your budget is. We’ll keep updating our recommendations as we look at new products and find stronger contenders. For this latest update, we’ve reviewed seven more headsets that include theG.Skill Ripjaws SR910, Razer Man O’ War, and HyperX Cloud Revolver. 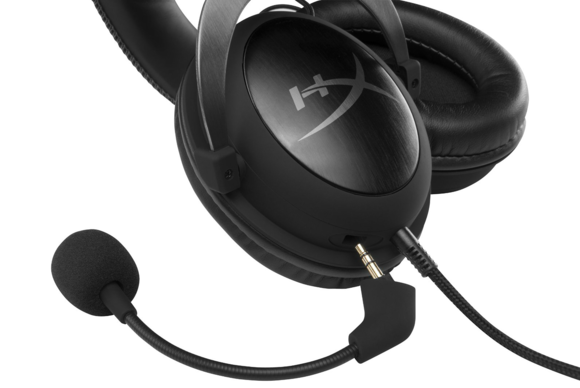 Our 2016 headset recommendation remains pretty much the same as our 2015 headset recommendation (and our 2014, for that matter): The Kingston HyperX Cloud. Or, if you’re feeling a bit fancier, the Cloud II. It’s comfortable, it sounds great, and (best of all) it’s relatively inexpensive. What else could you want in a headset? 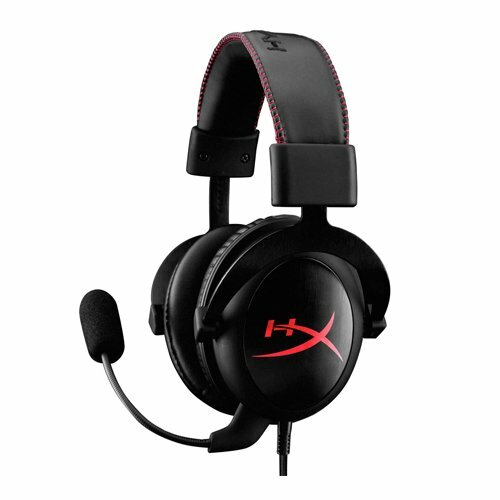 True to its name, the HyperX Cloud is one of the most comfortable headsets on the market. It’s hefty, with a solid-metal construction that belies its cheap price, but sits feather-light on the head. The faux-leather earpieces are generously padded, oversized, and form a good seal without squeezing too hard. And it sounds excellent. As I said in our review, this isn’t a studio-quality set of headphones. It’s got the typical gaming-centric bass boost and a slick high end, but both are subtle enough that the HyperX Cloud competes favorably with headsets twice its price. There’s no Kingston-provided means to adjust the sound, given that the HyperX Cloud connects through standard 3.5mm jacks, but you honestly shouldn’t need to tweak it at all out of the box. It sounds pretty damn great. Our only real complaint about this affordable headset is the mic. The only real downside is the microphone. It’s very flexible, which I appreciate, but has a tendency to pick up background noise and plosives while leaving your voice nasally and hollow. The slightly-more-expensive HyperX Cloud II is, I think, more a lateral move than an improvement over its predecessor. It swaps the 3.5mm connection for a 7.1-ready USB soundcard with better in-line controls and a bit of noise cancellation on the microphone, but you wouldn’t notice a huge difference between the two iterations and I’m not sure the increase in cost is worth it. Regardless, either model is an excellent choice for a gaming headset. In an increasingly crowded market, the HyperX Cloud nails pretty much every major category with few significant compromises. I hope the next model improves on the microphone, but for $80 it’s a steal. Frankly speaking, Corsair doesn’t really have any competition in this category. Most decent wireless gaming headsets will run you $150 or more. 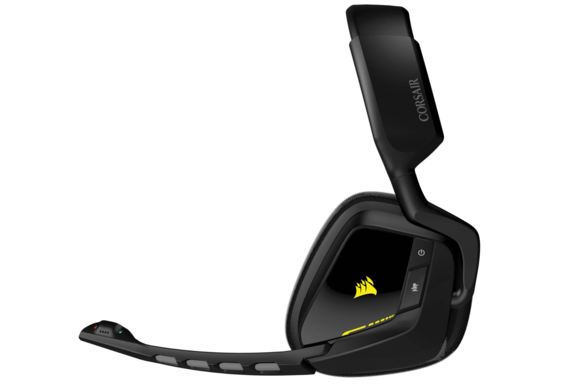 Corsair’s Void Wireless is priced at a mere $100, which leaves it on its lonesome. But even accounting for that vacuum, it’s pretty good. Not phenomenal, mind you, but at this price you’re getting a bargain. I wasn’t really sure what to make of the Void’s weird, diamond-shaped ear cups but after some use I’m actually pretty pleased. The Void Wireless sits a bit forward on the head, with the band resting just above your forehead. It takes some getting used to, but the end result is less tension on the jaw and more on the back of the head where it’s less noticeable. I wouldn’t say it’s as comfortable as the more traditional HyperX Cloud, but without a doubt I like it more than its predecessor, the H2100. The on-headset controls are fairly intuitive, with a volume rocker on the bottom of the left ear, plus oversized buttons for power and mute on the side. And it’s got 16.8 million color RGB lighting, if that’s your bag. 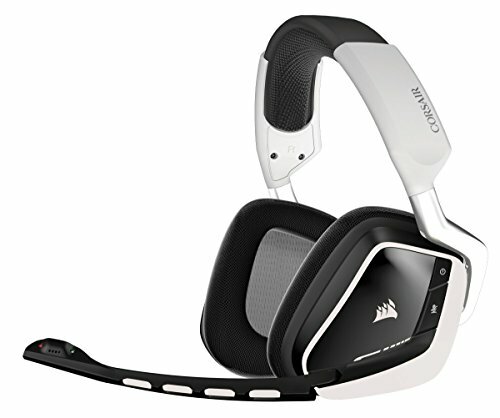 The Corsair Gaming Void Wireless is decently priced at $100. The biggest design issue is that the Void Wireless is heavy. It’s not a problem when sitting up, but if you look down or look up the headset has a tendency to slide around. I don’t know whether it’s because of the battery or the metal-augmented construction, but your neck gets a workout with this headset. Sound-wise, the Void Wireless still needs some work. It sounds passable, especially while gaming, but throwing on some music sets the Void Wireless’s limitations into stark relief. The low-end is muddy and distorted, and the whole range of mid-to-high-end frequencies sounds slick, like you’ve applied too much compression. You can adjust the headset’s sound in Corsair’s software, but Corsair’s software is still a bit unwieldy. Better than last year, I think, but still not on par with Razer, SteelSeries, or Logitech. Also, some users have reported problems with firmware updates—not a great sign. “This doesn’t sound like an incredibly positive review,” you might say. And you’re right, it’s not. The Void Wireless is not an incredible headset, as I said up top. But it is the best wireless gaming headset under $150, and given how many wires are attached to my PC at any given moment, the convenience of cheap wireless might be worth sacrificing a bit of sound quality. If you want to move up from the Corsair Void Wireless, Logitech’s G933 is the next logical step. Priced at $199 but typically on sale for $160, the G933 is still an affordable wireless headset—at least compared to the front-runners from a few years ago—and is an upgrade over the Void Wireless in a number of ways. The biggest improvement you’ll get with the G933 is its audio. Its sound is cleaner than that of the Void Wireless, across the spectrum. Though not bass-heavy out of the box, those who want more low-end get plenty of headroom for EQ tweaks—and it’s a neat, nuanced bass instead of Corsair’s muddier thumping. Mids and highs are also better, with none of the Void Wireless’s overly compressed slickness that crops up in the Void Wireless at louder volumes. 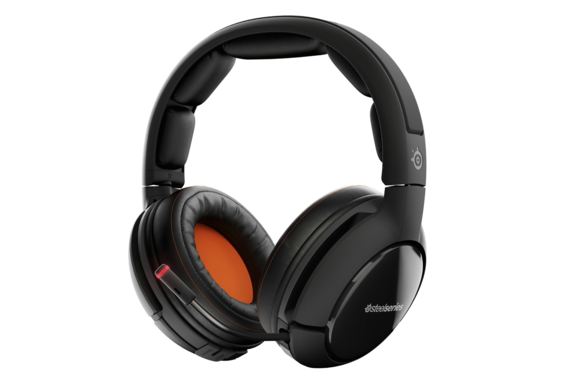 And the G933’s sound stage is impressive, with oversized ear cups that let sounds breathe even in stereo configuration. And while I won’t go as far as to award a medal to the G933’s surround-sound capabilities, I will say the feature is serviceable—for a headset, at least. 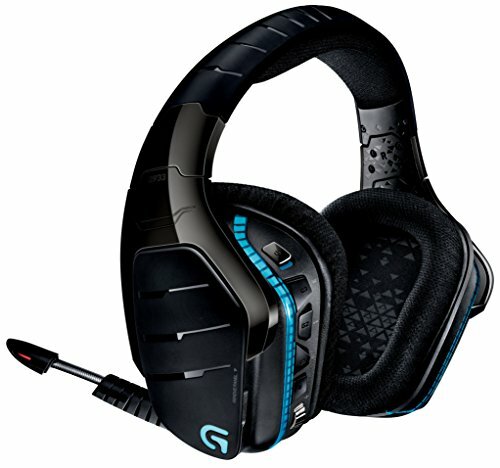 You can leave the 7.1 mode on without completely destroying sound quality, and in certain well-mixed games (like Battlefield), the G933 does a decent job simulating directionality. It’s not much better than stereo, and nowhere near a real surround sound setup, but it’s better than most headsets. I’m a fan of the G933’s build, too. This headset is hefty but smartly designed: The USB dongle sits inside one of the ear cups and underneath a magnetized panel, while five buttons on the rear of the left cup let you adjust settings on the fly. The G933’s primary downside is a microphone noisier than the competitors: It picks up the sound of my typing and every creak of my computer chair. As I said in our review, you’ll want to consider using push-to-talk, lest you annoy your teammates with incessant background noise. Get used to charging this headset, too. While its eight-hour battery life surpasses that of many older wireless headsets, it pales in comparison to the Void Wireless’s 12+ hour average. Overall, it’s still a great headset. Better ones exist—the Astro A50 and SteelSeries Siberia 800, for example. 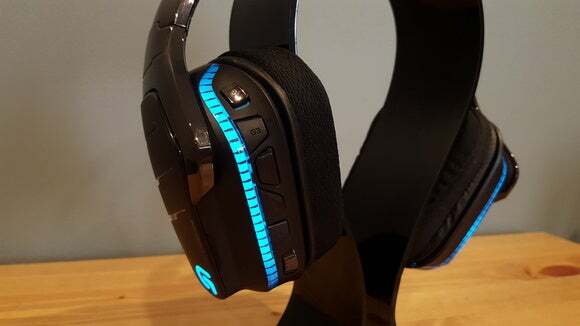 But given the G933’s price and performance, this headset might be the best-bang-for-your-buck wireless headset. Should you spend $300 on a gaming headset? No. Probably not. I’ve long maintained that for that amount of money you could snag a great pair of headphones and a decent microphone to fill the same gap in your life. But there’s no denying that the A50 reviewed here and Siberia 800 are top-of-the-line, as far as headsets are concerned. Wireless, above-par construction, above-par sound quality, easy EQ adjusting and chat mixing—they’re a step up in every category, even if they’re exorbitantly priced at $300 each. 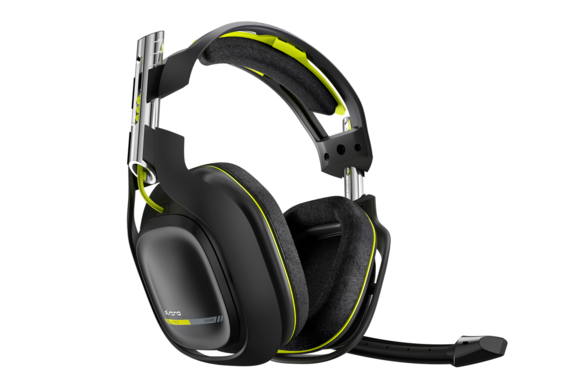 The Astro A50 is one of the best wireless headsets out today, and it’s priced accordingly. The A50 is the standard recommendation, given Astro’s reputation. And it edges out the Siberia 800 in a number of important categories—marginally better sound quality, a slightly clearer microphone, and intuitive controls. Actually, that last bit is the A50’s strongest feature. 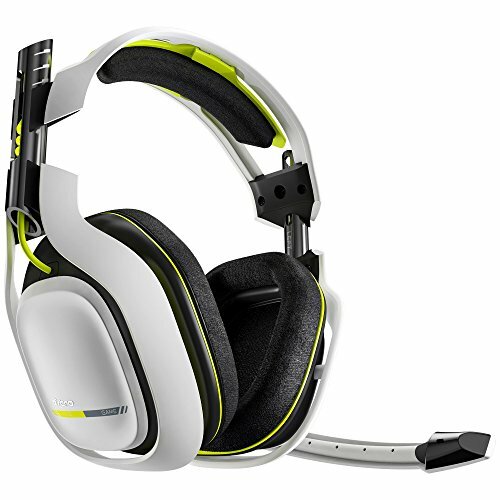 For a wireless headset, the A50 is damn easy to use. The volume knob is easily locatable on the bottom of the right earcup, Astro’s mixamp tech is built into the side, there are multiple EQ presets accessible by shifting a switch, and the microphone flips up to mute. Easy. The main drawback: The battery lasts only 8-10 hours, at which point you need to plug in a MicroUSB cable until you’re charged back up. Also, the charging cable that comes with the headset is only about six inches long, which is absurd. I ended up stealing one from an old phone charger as a substitute. This is where the Siberia 800 shines. Sure, the sound quality is slightly less impressive than the A50’s, as is the microphone. 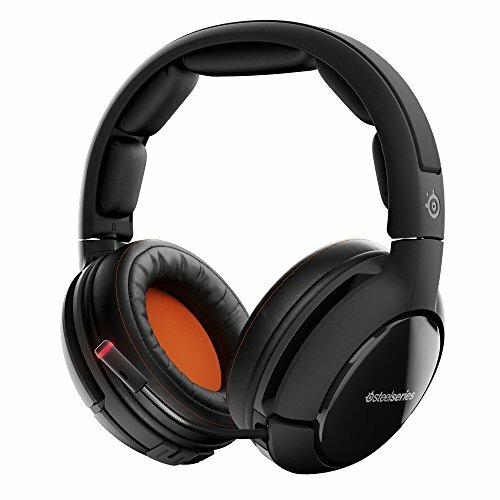 However, SteelSeries has devised an incredible removable battery system that I wish more wireless headsets offered. The headset comes with two removable 20-hour batteries, so one is always charging (by just shoving it in the base station) while you run the other down. The Siberia 800 was formerly known as the H Wireless. As for controls, the Siberia 800 doesn’t use dedicated buttons/knobs for each function. Instead there’s a single clickable wheel—by default used for volume, but which can also navigate menus on the base station’s OLED screen. It’s great, giving you a bit more control over your tweaking and more options than the A50. On the other hand, it’s not too useful if you’ve stashed the base station somewhere you can’t readily see it. Both are neck and neck in terms of comfort, too. The A50’s slightly-elongated earcups are a better fit for me, but the felt gets really hot and sweaty during long play sessions, especially in the summertime. The Siberia 800’s faux-leather stays marginally cooler, though the round earcups aren’t a great fit and the headset has a tendency to clamp tightly on the jaw. It’s a toss-up. Again, I think you’d be better off spending your $300 on a decent pair of real headphones and a standalone microphone, but if you want an all-in-one package and (more importantly) want a decent-quality wireless gaming headset, both the A50 and Siberia 800 are worth looking into. Design/comfort: Obviously you want a headset that fits well without snapping in half the first time you put it on. Headsets are tested with our vigorous and ultra-scientific “I bent it a lot and saw if it seemed durable” method, as well as against the internationally recognized “I wore this for eight hours and it didn’t give me a headache or make my ears feel like sandpaper” baseline. Sound: There will always be the people who say, “Why buy a gaming headset when you can buy a decent pair of headphones and a standalone microphone?” And those people are right, but they’re sort of missing the point. There’s something to be said about a product that performs just as well when watching movies/listening to music as it does while playing games. After all, I assume most people want one pair of headphones for their PC, not multiple pairs for different tasks. With that in mind, we test headsets at PCWorld in various games (Battlefield 4, Rainbow Six Siege) but also listening to music and watching videos, to make sure you’re getting a decent all-around experience. These aren’t necessarily studio-quality headphones, but that doesn’t mean it should sound like all-bass-all-the-time. Price: How much are you willing to spend on a gaming headset? That’s a purely subjective question, but it’s something we try to keep in mind. Our best all-around option is a bargain at $80, but if you want to throw $300 at Astro for a pair of A50s we’re not going to stop you.